Note: I originally wrote this for SubMain. You can find the original here. In one of my previous posts, I wrote about the .NET build configuration system. I mentioned the app.config file, but didn’t really dive into it. So let’s take a closer look at this file now. 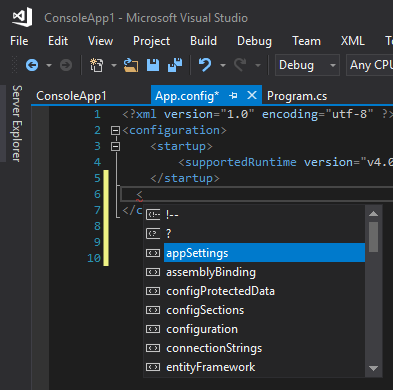 When you create a (non-web) .NET Framework application in Visual Studio, an app.config file is added to your project. 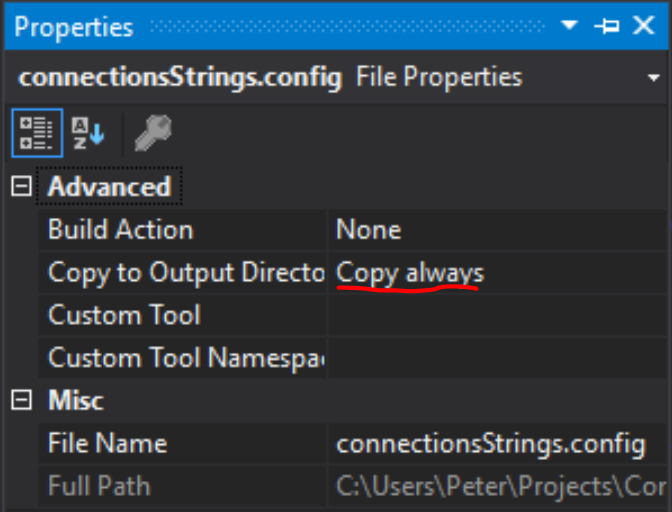 When you create a class library or a .NET Core project, such a file is not included, although it can be done afterward. In a web project (i.e. ASP.NET) you will use a similar file, the web.config. A lot of what I will cover in this article is applicable to web projects, but there are subtle differences. That is why I’ll only focus on the app.config. The most well-known sections are “appSettings” and the “connectionStrings”. As a side note: you will need to import the System.Configuration namespace too, by adding “using System.Configuration” at the top of your file. A possible problem with AppSettings is that we will get back a string. Yet in the above example, we’re clearly working with an integer. We will have to parse the value for it to be more meaningful. Another issue is that there is no compile-time checking that we entered the correct key, as it is just a string. If your needs are simple, you could be fine with this. If things start to get a little more complicated, you might want to look into “Settings”, which I’ll cover later. Notice how there is also a “providerName”. This tells ORM libraries like Entity Framework which provider they should be using. The provider will differ depending on the database you’re trying to access (e.g. SQL Server, PostgreSQL, MariaDB, etc.). The nice thing is that we have compile-time checking now, and we’re sure the “pollInterval” variable is an integer. The Settings system has now created two new files under the Properties folder: Settings.Designer.cs and Settings.settings. You do not need to look into these files, and it’s best not to change them manually. They are automatically generated, so any changes will be overwritten anyway. The result of these two files is a class containing the settings as properties. By the way, you can change the access (public or internal) by using the dropdown in the Settings tab of the project properties. For more on the .NET settings system and the difference in scopes, check out the MSDN documentation. There is a next step in app.config possibilities: custom configuration sections. These merit a separate article, so I will only cover them here shortly. As I mentioned at the beginning of this article, a class library doesn’t contain an app.config file. But sometimes, the author of a class library might want to allow other developers to configure certain parts of the library in the host’s app.config file. One option would be for the author to document the necessary AppSettings. But the AppSettings have the disadvantages I’ve already mentioned, and they don’t allow for any deeper hierarchy. This is taken from the .NET docs, and even though it concerns ASP.NET, the same mechanism is used in classic desktop apps. and finally provides the configuration details. You can see that the pageAppearance is more complex than the simple AppSettings or Settings sections can handle. As I said, this is beyond the purpose of this article, but I encourage you to check out the documentation I linked to above. So far, we’ve only covered application settings. But we can consider connection strings as a sort of application setting too. This is where we define which .NET runtime(s) the application supports. You could change this if your application needs to run on other (higher or lower) runtimes. The assemblyBinding tag is another tag you will encounter easily. In short, it allows you to point to a certain version of an assembly, even when a different version is required. Again, this is out of the scope of this article, but the documentation should help you further. Another example is the system.serviceModel tag, which is the place to configure any connections to WCF services. What Happens When We Compile This? When you start your application (ConsoleApp1.exe in our example), the matching config file will be loaded too. Keep in mind that a new compilation or deployment can overwrite the changed values. So it’s better to make the changes in your source code (which is under source control, right?) and redeploy. You should consider not putting confidential information in your config files. Things like passwords and API keys should be kept out of the app.config file. In an age where more and more code is made open source, you could risk exposing your secrets to the outside world. Even if your repository is private, it’s a best practice to put the secrets elsewhere. First, if you find it normal to do so, you won’t do it when you’re working on a public and open source project. But second, you never know when your private repository may become public, on purpose or by accident. See how both the appSettings and the connectionStrings point to another file? Also note that we can combine an external file with appSettings, but for connectionStrings we need to choose. After that, you can use the appSettings and connectionStrings in your code like you did before. In all other locations of your code, you can now call this class and be sure you’re getting an integer. This article aimed at showing you the basics of the app.config file, and some best practices. The app.config file is a basic piece of the .NET Framework, yet I’ve seen several projects putting their configuration in other places (like plain text files or the registry). Unless you have a very good reason to do so, it’s more convenient and familiar to use the app.config file. 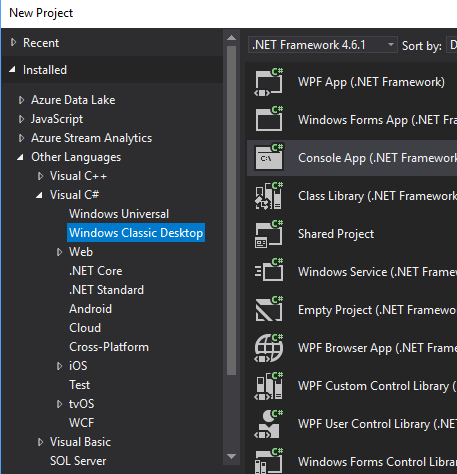 You can change it easily, the .NET Framework supports it out of the box and almost all .NET developers know how it works.